This kids mini pizza recipe takes the pressure off when the youngsters are calling out for a quick but satisfying meal. Making meals for kids that are both fun for them and easy for you can be a huge challenge especially on a busy day. But this recipe is a delight as it contains the carbohydrates which are needed for brain and body function while still topped with wholesome veggies. The best part is the kids love them and love you for making them. Separate the English muffins so you have 8 pieces. Preheat stove to 375 F then grill muffins directly on rack for about 1-3 minutes until toasted or a little crunchy. Then remove and spread enough pizza sauce on English muffins just enough to cover the surface. Now cover each one with a slice of thin cheese and 4-5 slices of pepperoni. Add a few fresh pepper slices and finish with some tomatos. If using cherry tomatoes place cut side up so when they warm up they release their flavors better. 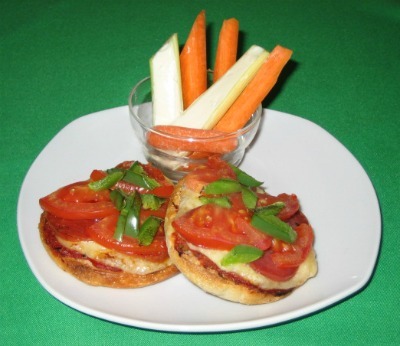 For a tasty finishing touch sprinkle a little Italian seasoning on each of the kids mini pizzas. Place on foiled or easy to wash tray. Turn oven onto broil and grill muffins in oven for 4-5 minutes or until cheese is bubbling. Cool for a minute as cheese can be very hot. Sometimes (but not always) it is more economical to buy a large block of cheese. Just slice the cheese into the appropriate size and thickness just like the ready to go slices. This delicious and fun kids meal makes 4 servings.